So let me back up. I picked out one of my mom’s paintings to go over the fireplace, but as you recall, the painting was too small for that space. So many of you had some really great and creative ideas for how I could use the original artwork. But you know how it is when you get a certain vision in your mind of exactly what you want, and you know that nothing else will do? My order arrived last Friday, and I was anxious to get it framed and on my wall. So my mom and I headed to Hobby Lobby to grab a frame. Not only did they not have any frames I liked at all (it seriously seems like they’ve carried the same exact frames for the last decade), but they didn’t have even one single frame in the size I needed. I checked their custom order moulding, and didn’t see anything I liked. So my mom and I headed over to the place where she’s had all of her stuff custom framed for the past 20+ years. 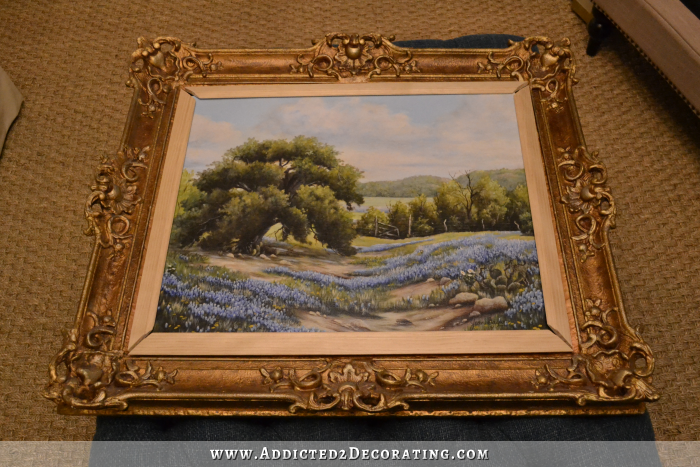 As the owner pulled some of his ready-made frames from his stash, I glanced over and saw the absolute most beautiful frame ever sitting on an easel and framing an oil painting. I wish I had taken a picture of it! It’s like it came right out of my vision for my living room. It was huge, and a very odd size, but it was gorgeous. So we went back to looking at moulding. But I couldn’t get that frame out of my mind. I finally did pick a moulding for my artwork. The color was a garish brassy gold, but I loved the shape of the moulding and the detail on it. I knew that I could tone down the color with some antiquing (either with stain or dark wax), so I wasn’t worried about that. So I placed my order, and he had it ready for me the next day. See how bright gold it is? But again, I wasn’t concerned about the color. That’s nothing that some dark wax or stain can’t take care of. I really did like the shape of the moulding, though. But when I was in the shop to pick up my frame, just as I had paid for my frame (which came to $130 for this custom frame), grabbed my purse, and started heading for the door, a frame caught my eye. It was sitting on the floor, and it looked so similar to the one-of-a-kind $1200 frame I had fallen in love with the day before. I casually said, “I guess that’s another one of those really expensive frames, right?” I kind of laughed and kept walking, expecting him to give me some extravagant price that I could never and would never pay. Quite honestly, I never expected anything to come of it, but later in the afternoon, he called me to tell me that I could, in fact, have the frame! I dropped my paint brush so fast (I was painting the sofa at the time), put my shoes on, and headed out the door in a flash. The whole way there, I kept trying to remember the size of the frame, and wondering if it would fit my print. Then I would tell myself not to get my hopes up, and then I would start hoping it was just the right size. By the time I was pulling into my driveway with my new frame, I had thrown all caution to the wind. I just knew that it was meant to be, and that my new frame was going to be the perfect fit for my print! It was about two inches too big in height and width. But I wasn’t going to let a couple of inches ruin my vision. I was determined to make it work. So I headed to Home Depot and grabbed some moulding to fill in the spaces. I just used my miter saw to cut them to size. 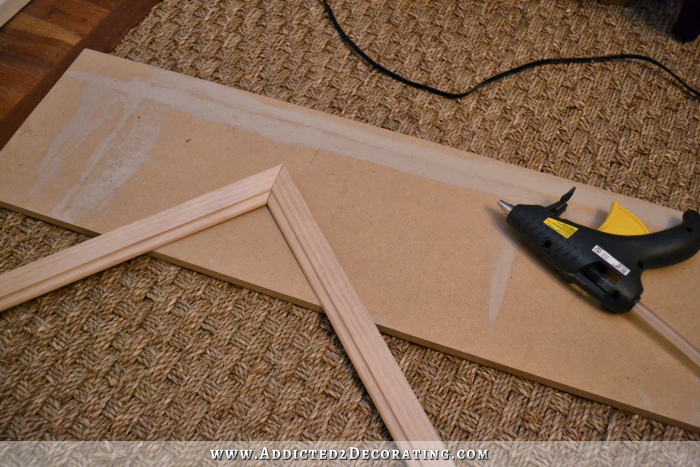 Then I used my hot glue gun to attach the pieces to form a frame. With all four pieces attached, I placed it inside the frame just to double check the size. And then I tried it with the print to be sure that it covered all of the edges of the print. It worked! Now I just needed some color on it. I knew that there was absolutely no way I would ever be able to match the color of the frame, so I went a different direction altogether. He had also given me two other old frames (a matching set) that had a dark stained detail on them. So I decided to do something similar, and stain the new frame liner. I used Rust-Oleum wood stain in dark walnut. By the way, that’s just one coat of stain on pine trim. Just want to point out once again that there’s no way in heck that Minwax stain would have covered pine that beautifully. I don’t get paid anything by Rust-Oleum for recommending their products. I simply recommend their stain because it’s the absolute best. When it was dry, I placed it inside the frame, got it centered just right, and used painters tape to hold it into place. I was very nervous using painters tape on the front of this frame. I don’t know if it’s actually an antique, but I do know that it’s very old, and some places on it are a bit brittle. So I was as careful and gentle as possible. 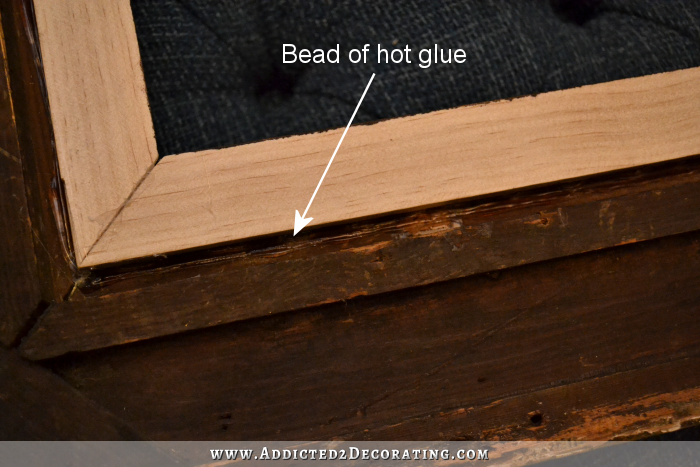 With it in place, I turned the frame over, and used hot glue to attach the liner. Note that I did not lift up the liner and place the glue under the edge. I just placed a bead right along where the liner met the frame. Then I placed the canvas on the liner. You’ll notice that I didn’t center the canvas. When my mom used Photoshop to increase the size from a 16 x 20 to a 20 x 24, it actually left some blank space (about an inch-and-a-half) at the top that she had to fill in with clouds using Photoshop. So that isn’t part of the original painting. This new frame didn’t require that extra part at the top, so I was actually quite happy to place it in the frame so that the Photoshopped part would be hidden behind the liner. Once I had it just where I wanted it, I used another bead of hot glue to secure the canvas. Again, I didn’t lift up the canvas and place the glue underneath. 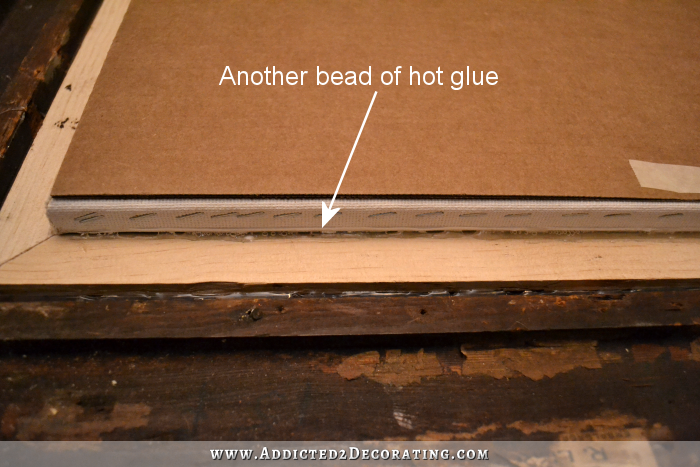 I simply placed the bead of hot glue right along the edge where it would touch both the canvas and the liner. Please note that I never, ever, ever in a million years would have hot glued an original piece of artwork to a frame!!!! If I were using the original artwork, I definitely would have come up with another method. But since this is a print, I had no issue with using hot glue. And with that, it was done! And here she is in all her glory. I can’t even explain to you how perfect I think this is. It’s like my vision for the artwork above my fireplace completely materialized right there in my living room, and the odds of that actually happening I thought were slim to none. I can’t stop staring. I think it’s the most beautiful thing in my whole house. Before this frame fell into my lap, I had ordered some sconces from Shades of Light. They’re supposed to be here on Friday, so I’m anxious to see if they’ll still work with the new frame. I sure hope so! Sconces would complete the vision I had in my mind for this wall. Well, except that my vision included an overmantel with trim and painted white to match the fireplace, but now I’m second guessing the overmantel. I love how the frame looks on the rich teal wall. So we’ll see where I end up with that. Previous Post Do You Know How EASY That Would Be To Make?! That looks amazing! Great job. Jealous! What a genius solution! It looks absolutely gorgeous!! Beautiful! Where is your ottoman from? She made it from scratch. I looks STUNNING!!! I cannot believe that you got that gorgeous frame for FREE!!! I think that, somebody deserves a round of coffee and donuts, for their contribution to your home, and your vision for it! I love that your Mom Paints!!!! Both of you are so talented! As always,,,keep up the GREAT work!!! Gorgeous! What a lovely lovely picture and an elegant solution! Please don’t change a thing!!! It looks gorgeous! Out of all of your projects I’ve seen, this is by far my favorite. 🙂 I hope you showed the gentleman at the frame shop your finished project, too. I would wonder what you did with it.lol I really like the idea for sconces, and I think they would complement all of your hard work beautifully. Thanks for the inspiration! Everything is coming together beautifully! I admire your “go for it” attitude. Great vision! I can’t stop staring either, it is drop dead gorgeous! Just curious, how will you get power to your sconces? Are you going to DIY that? I always want sconces on either side of a bathroom mirror (with little silk shades like in a fancy hotel) but the prospect of fishing wires is daunting. And that’s only possible if you have typical framing and drywall. Absolutely lovely! Perfect in every way. Have a blessed day! It looks great hanging on the wall and what a score of a free frame- too bad you had already spent the $ for the other one though. It looks amazing and the placement is perfect. I so enjoy your sharing your projects. It empowers me to keep on doing the projects I love. Krisite that is just beautiful! How clever of you to build a liner. Problem solved. I like the walnut tone of the liner too. The other thing you could have done with the liner is to cover it with some sort of linen material. In looking around my house and on the internet I see lots of framed artwork where the inner liner is cover in linen. You are an inspiration! Thank you for the post! I know before you had a good reason to have your mirror hung low. Will you still be hanging this picture low or will you center it more? Wasn’t sure if you hung it on the original nail just to see it what it looked like. I was skeptical of the frame in this room but that added trim really helps the flow. Also, same question as above…any tricks for writing if you will be using the sconces? It’s beautiful. It pulls the whole room together. I was always told if thing are meant to be they will work themselves out and it appears that was the case with this painting belonging in that room. Excellent! love your thought process in making it work for you. The frame is beautiful and the print looks great in it. What a find! Well done! I, for one however, am sincerely hoping you don’t abandon the overmantel. I’ve been so anxious to see that project come to life. I think the artwork will still look wonderful there and the white overmantel will make that wall even more striking. It’s so perfect. I had in my mind that you would order a 1″ linen liner, possibly in the blue of the blue bonnets. It never occurred to me that a wood liner could be used since I had never seen that done. You’re ingenius! So happy for you! Now the painting is the star of the room. You are very creative and resourceful…I thoroughly enjoy your projects. Keep doing exactly what you’re doing…….thanks! What a story.. Such fun! Thank you for sharing it. Oh, and yeah…….. THE PICTURE LOOKS AMAZING! LOVE! I am so stinkin’ excited for you! This is beautiful! What a find on that frame! I love how you you never say,..well that won’t work now. You just come up with a how to make this work solution! Perfect!! I love every part of it! You come from a gifted family too! Now that is serendipity at it’s very best!!! It looks gorgeous!!!! The frame turned out wonderfully! Not sure how I stumbled upon your website/blog but so glad I did! I love how you put your little touch on everything and how you think outside the box. I also like how you can take ideas from someone else or from a different project and make it your own! Don’t let the HATERS get to you…keep dreaming and creating! That frame is gorgeous !!! Will we get to see the lights installed on Friday ? I really do NOT want to wait for Monday, lol. Wow! Wowie! WowZa! Talk about visual impact! Wow! Yay! Gorgeous! Love the way it looks ! 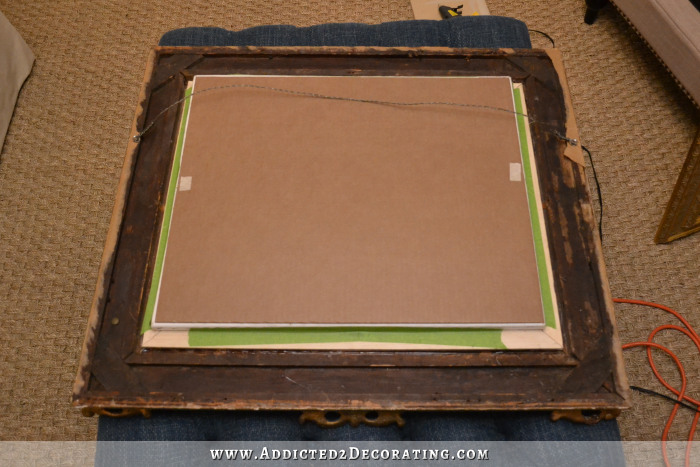 Oh Kristy, it’s GORGEOUS and what a great idea for making the canvas fit the frame. I was thinking instead of sconces maybe you could install an art light above it so that the light shines directly on it. Just a thought. I can’t wait to see this room to completion. It is soooooo beautiful already! I can’t tell you how happy I am that you went with this beautiful painting. I love it and it’s perfect for your living room. When you showed us the paintings to choose from this is the one I totally envisioned over the fireplace. I saw it in a large wooden frame with a small gold inset frame but I like your way better, of course! Great job now grab a coffee and enjoy! Kristi – As usual, you have done a beautiful job! It can be so frustrating to have a picture in your mind of EXACTLY how you want something to look and then not be able to find what you need in the marketplace! Your creativity never fails to inspire me! After following your blog for a while, I now find myself thinking, “how can I change this to make it fit what I have in mind?” You are my decorating mentor! Your living room is coming along so beautifully! I can’t WAIT to see it finished! Have a wonderful day! Wonderwoman strikes again!!! It is gorgeous. Looks great! And your mother’s painting looks just beautiful in that room. Perfect. I am so envious of that frame. I found a very poor imitation of that frame in the trash years ago, but it had been rained on and the plaster frou frou was peeling off. I’m still trying to be brave enough to try repairs. Absolutely gorgeous! Everything you touch turns to GOLD!! OMG! I would be staring at that all day too! Absolutely gorgeous! Absolutely gorgeous! 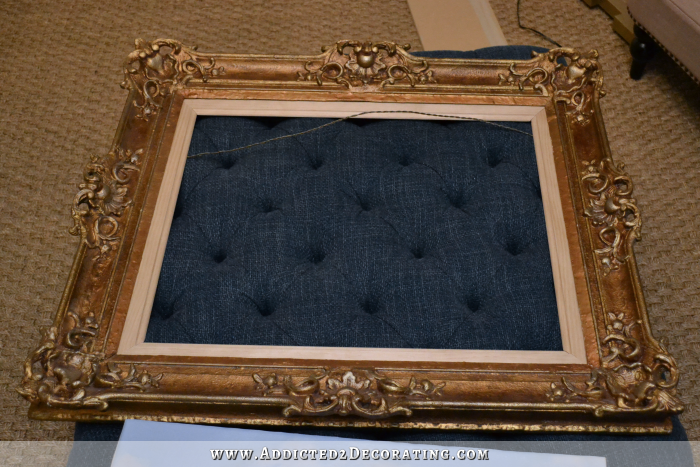 What a beautiful, ornate frame….I can hardly wait to see your sconces. absolutely gorgeous! Love, love, love how it turned out! Your finished product looks like a museum quality piece. Your ability to take something from your mind and create it is awesome. And your fiscal restraint is just as impressive. 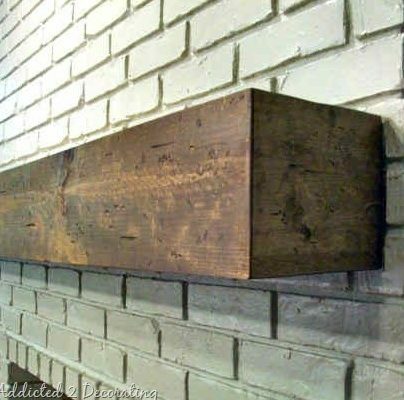 I’ve been inspired to tackle some small projects in my house! Hi there! Beautiful job. Just thought I would add a thought for the future. I worked in custom framing straight out of high school over twenty years ago now, but I learned the old school ways from the owners. 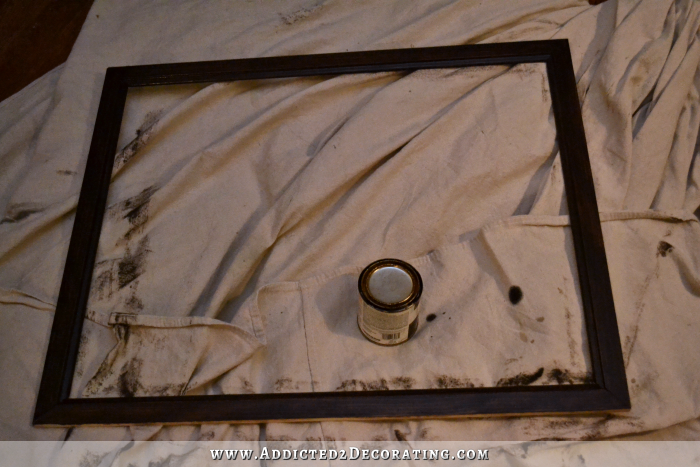 We once dealt with a frame similar to yours that needed cleaning to be suitable for reframing a nice piece of artwork. The lady teaching me said to never use harsh cleaners on gold leaf. We went to the store and got fresh whole milk that we gently rubbed on the frame with super soft diapering cloth and q tips in the crevices. She said it cleans and conditions without stripping. Hope that helps in the future so you don’t lose the luster on your frame. Absolutely stunning! I bet your Mama is beaming from ear to ear, too! Your mother is quite the artist. Beautiful work, both of you. Beautiful! I love the whole story of the picture and frame and how it all came to be showcasing your mom’s artwork in your work-of-art living room! 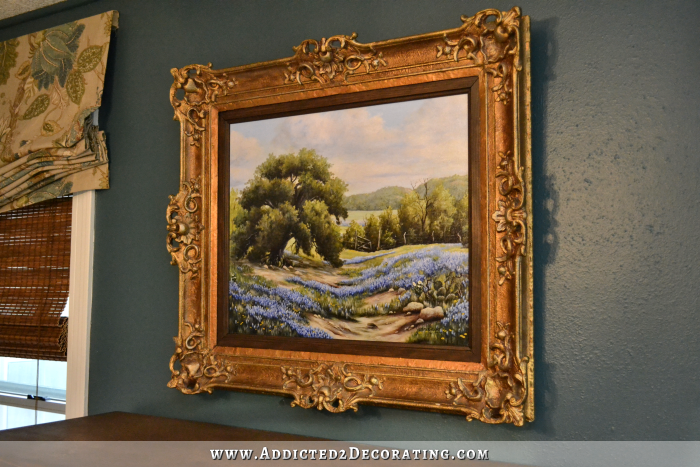 A gorgeous painting, in a gorgeous frame, in a gorgeous room! Keep up the staring-this is too fabulous of an experience not to! Brilliant IDEA! The possibilities that have now opened up! wowzers! Thanks for sharing! 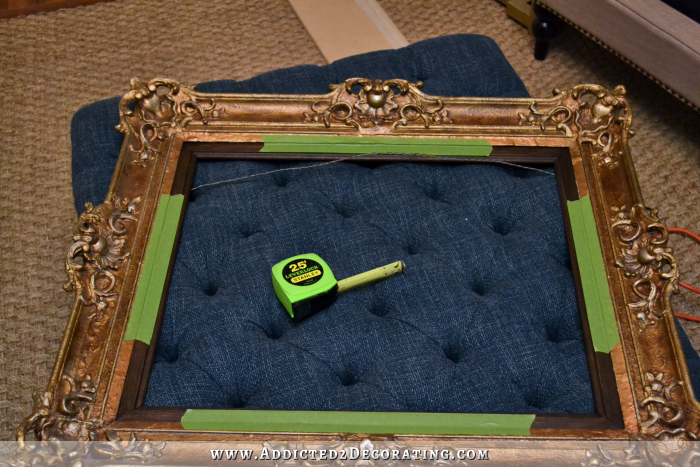 Gorgeous frame and awesome hack to fit the artwork! Kristi you did a wonderful job with that beautiful frame (I wouldn’t expect less) but WOW your Mom is really talented. What a wonderful job she did with that painting. Gorgeous! Absolutely gorgeous. I love your problem solving skills. Wow! You lucked out getting that frame for free! I completely got the feeling of sick anticipation after falling in love with that frame just prior to the shop owner saying he would give it to you. Something like that is usually too good to be true. I like the fix you made with the moldings stained dark. It works for me. In gazing at your after photo I finally realized that one of the things I like so much about the way your mom’s painting turned out is that the substantial frame just makes the painting sing even more. And – not that that wasn’t enough – since you made the fireplace instead of installing a shallow prefab mantle the entire tableau now has the substance and depth each of them individually deserves. As usual, the whole is greater than the sum of the parts! Elegance, beautiful color pallette, great style. Not at all sure you need the overmantle now. My suggestion would be to wait until more of the room is complete and then decide about the overmantle. Be proud. This is awesome. Love it! That is the most beautiful frame. I couldn’t help but admire the picture for some time! LOVE LOVE LOVE this whole process! What a great story and you are so clever to have worked it all though….plus share with us the story as well as the great photos….. I love when it all comes together and so glad it did for you! 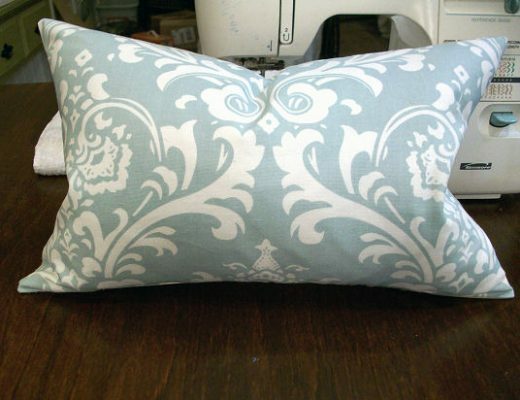 You will love that photo even more now, knowing what a great find you made with the bonus part of making it work! Can’t wait to see the lamps! Wow! It’s gorgeous! It’s like the art and framing gods have smiled upon you. The whole thing worked out so perfectly like it was all just meant to be. 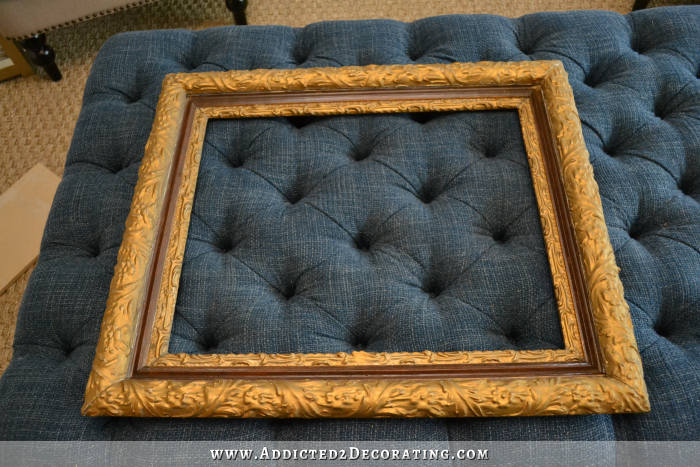 The frame you actually had made that you paid $130 is GORGEOUS, and I’m sure you’ll find a use for it as well. The frame you were given (how NICE of that man!) that you ended up using is stunning, and works so well with the replica of your mom’s gorgeous artwork. No wonder you can’t stop staring! Kristi that is absolutely gorgeous!! Your Mother is so good to you and to have her artwork to dress and adorn your living room front and center is awesome. You are a blessed woman….and a very hard working one! You deserve the time out to admire what is beautiful to you and so dear. Spectacular! Love the frame, love the print, love the teal wall background and loving this room! Just keeps getting better and better! Absolutely gorgeous! I voted for this picture of your Moms,and then,to have this beautiful frame dropped in your lap,……..what a piece of luck! Perfect! Absolutely GORGEOUS!!! It is so beautiful and your mom did a stunning job with the painting as well. Kristi, looks beautiful. I think two sconces on each side will make it too busy and leave no negative space. Have you consider a single art lamp over the artwork? It would illuminate the art piece rather than the walls next to the art. Gorgeous, stunning, perfect. 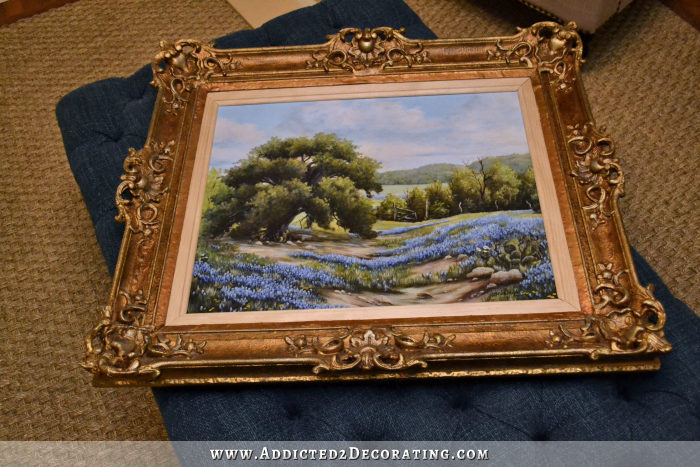 I love it so much and I am so happy you chose the bluebonnets since you are a Texan (me too) and would love to have a bluebonnet scene just like it. I sure hope your mom decides to paint again. This would be my request. 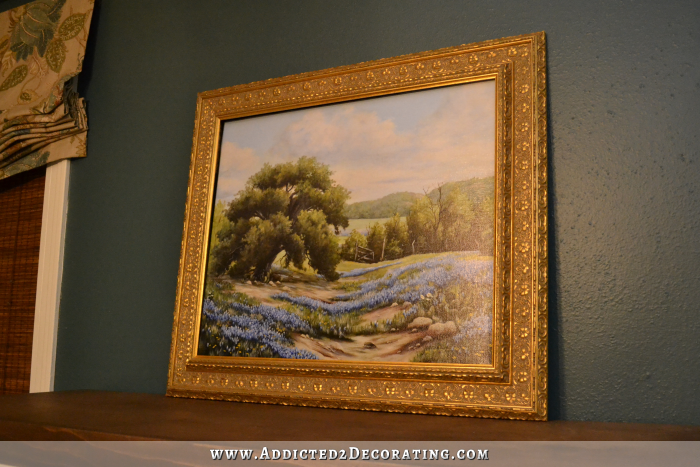 I have a 3 x 5 oil with bluebonnets I love but want a larger one too. Perfect! 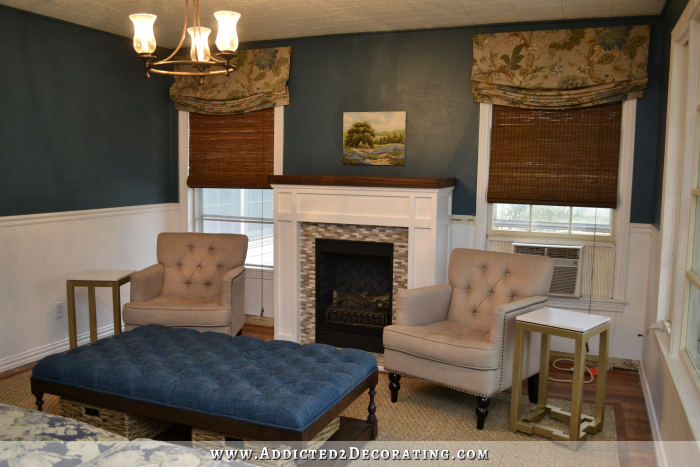 Love how the stained molding ties everything together! Another Kristi brilliant idea!!!!! Oooh, love it! I am a frame collector, I have a bunch waiting for the ‘right thing’. I also have artwork I’ve collected over time. I need to rotate it. This is incredible,love it! Hi Kristi, I have been following your blog for a short time now and I love it. Wish I had found you from your beginning. I absolutely love how your picture and frame turned out. 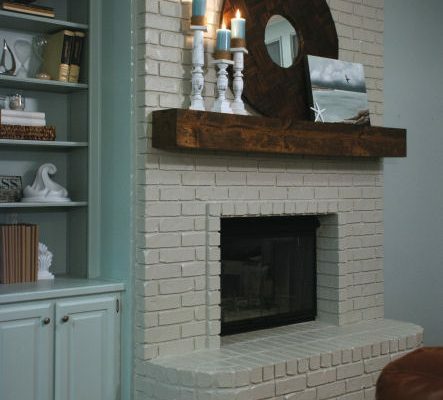 I do not know what an overmantel is that you are referring to, but in my humble opinion, if the picture was mounted on any color except the color of your wall it is on now, it would simply vanish into the wall. 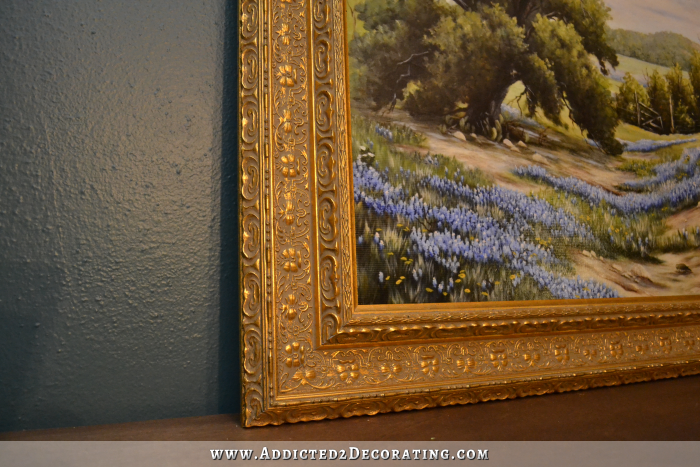 The wall color makes the picture and the antique gold frame just pop in the room! I do not think it should be centered on that wall — it should be by all “hanging rules” exactly as you already have it hung. It would look too matchy-matchy if it were centered and it simply would not look “right” or eye appealing. I am OCD about a lot of decorating things, but when it comes to hanging pictures, they need to be at eye level and more space at the top and they need to relate to whatever they are hung above if anything. I truly enjoy reading your blog everyday and wish that I was as talented as you are when I was your age. Now I do not have the patience or the know how to complete a project from scratch like you do. Keep up the great work and the blogging. Did you say you do still hire out to do redecorating? Can’t wait to see the full room with the couch and the art! Almost done! LOVE IT!!! You rock! I can see who you get your talent from. you both are really great with your hands. Love your blog more everyday. Wow that frame liner you made modernizes it in a really nice way. I totally know that rush from putting together something so perfect. Like it came out of your head, and just fell into your lap. Especially when all the other projects you have to accomplish have their ups and downs. I’m so happy for you and so glad you chose this picture from the choice you had – it’s simple perfect with your wall colour and the entire room! Lucky you that you got that stunning frame – and I’m sure you’ll come up with a good use for the one you bought as well – there’s so many more rooms in your house (and so many more beautiful pictures by your mom)! I was really looking forward to see how you build the overmantle but am with you there now in sayign: just don’t bother, it’s already perfect. Stunning… As is all of your creative designs. Keep up the good work! How about giving a shout out to “the place where she’s had all of her stuff custom framed for the past 20+ years? They were very generous in giving you that frame, so why not send some business their way as a thank you? Oh My Dog!!!!!!!!!!!!!!!!!!!! I don’t blame you one bit for wanting to just gaze at this all day – STUNNING is not a rich enough word for this!!!! I love it, most gorgeous thing ever. I am green with envy as I would love to have that. Lucky, lucky girl! A MA ZING! Would love to hear about how you would stain that garish gold frame. I have one (HUGE) that has a Kincade in it. But it is GOLD (I bought it in the late 90’s) Now I HATE the frame…. and I want to know how you would use stain or wax to fix it!! Hi, I commented on your ac dilema abd went back to look at your room since I have just started following you. I hope you don’t mind but I would like to ask some questions and make some suggestions. First of all I love the color of your walls. I am very big on using dark colors. I think they create drama and also can create a cozy feeling. Did you make your side tables? Are you totally committed to them? The reason I ask is I think they are not to scale with your chairs. Do you have a smaller round table anywhere in the house that you could “borrow” to see what I mean? My image is the “AC” chair moved away from the fireplace and closer to the wall and angled a bit differently. Thr round table would go on the fireplace side of thr chair. For the other chair, I would eliminate the table and replace it with a potted plant. Your cocktail ottoman is large enough to service the chair as well as the sofa. I would also place a tray on thr ottoman at an an angle to the chair. Also, you should take the pink tag off the AC.unit cord and remove the yellow efficency label from the side f the unit. I know your room is a work in progress and I hope you don’t mind my suggestion. Sometimes it helps to have fresh eyes look at something. I love following your blog, you have such great ideas and are so talented. Yay, that free frame looks fab! And what a great way to fill the gap! Must remember that should it come up! i love how your brain works. Your focus and determination could run a small country. Thanks for all the beautiful inspiration. I love your living room that looks modern and attractive with simple design. Nice designs especially the small niche design. 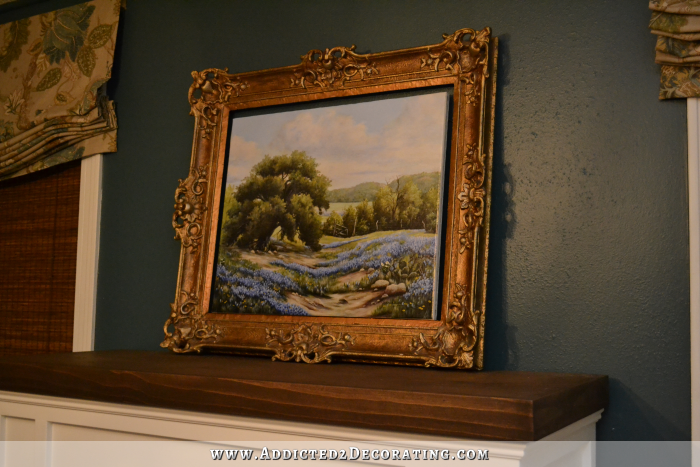 A nice addition to an area where artwork, which you have used above your fireplace, is amazing. 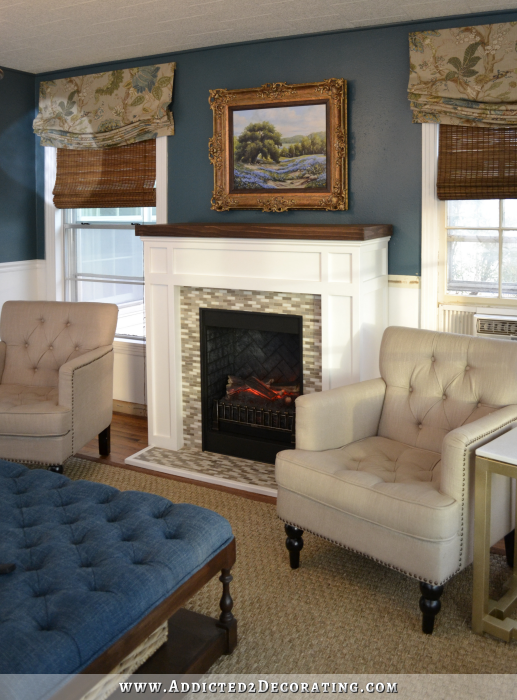 In any room, a fireplace stands out as a focal point. It really looks great. I love the way you solved that problem. I just have to say, though, that if I had an original piece of art, I would do all I could to make that work. Especially if my mother painted it. 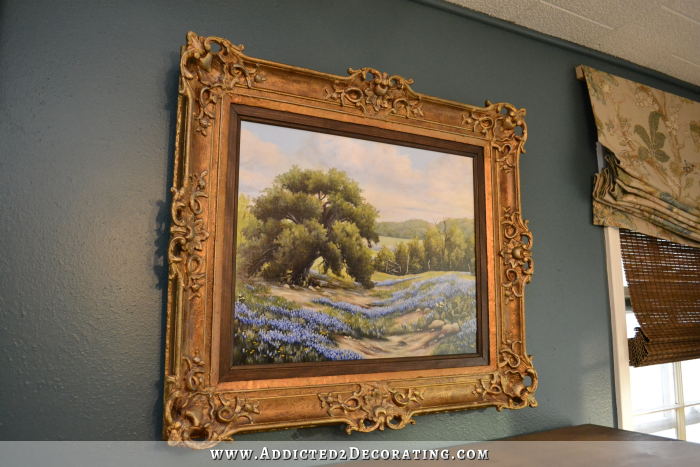 You definitely could have done the same thing with the original painting using matting and using the same exact frame, or a smaller one which I think would be a better size, especially if you want to do sconces on either side.